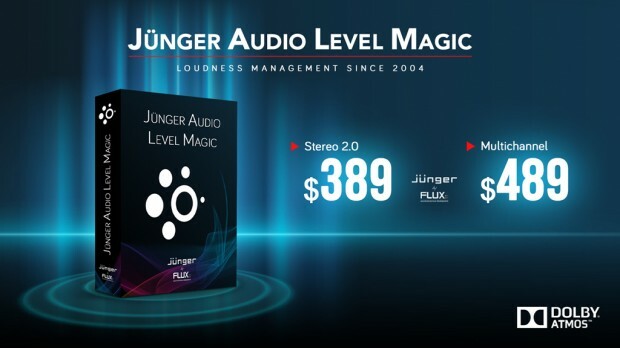 Flux:: / Jünger Audio announce repricing on their high-end professional Level Magic Stereo and Multi-channel product line!From today, you can purchase Level Magic Stereo at $389 LIST or Level Magic Multi-channel $489 LIST at the direct links below from our store. The pricing has been dramatically reduced on these highly regarded products used many broadcast facilities worldwide, with Stereo formally $860 (MSRP), and Multi-Channel $1190 (MSRP). Available in AU / VST / AAX Native / AAX AudioSuite plug-in formats on Windows & Mac OS X. The first incarnation of the now legendary loudness management processor Level Magic™ from Jünger Audio, Germany, was released 2004 and has since then become one of the standard components in Broadcast studios all over the world. Level Magic™ is a comprehensive loudness management processor utilizing an algorithm, developed and enhanced over several years by Jünger Audio, highly adaptive to the structure of the incoming audio producing a result without artefacts such as pumping, breathing or distortion. Now, 14 years later, Level Magic™ is available as a standard DAW plug-in, and is compliant with all known international loudness norms and regulations including; ITU-R BS.1770 (all revisions), EBU R128, ATSC A/85, ARIB TR-B32, Free TV OP-59, Portaria 354. The Level Magic™ plug-in offers intuitive and adaptive high performance loudness management in stereo or surround for television and radio broadcast supporting up to 10 channels for Dolby Atmos and the AVID Pro Tools Dolby Atmos 7.1.2/7.0.2 Track and Bus. More info can be found at the product pages linked above, and you may also trial the product prior to purchase from the Flux:: website here – Download Demo Version! This entry was posted in DontCrack, Event, Plug-ins, Promotions and tagged ARIB, ATSC A/85, Broadcast, Dolby Atmos, EBU R128, Flux, Free TV OP-59, Jünger Audio, Level Magic, Loudness, Multichannel, Portaria 354, Stereo, TR-B32. Bookmark the permalink.